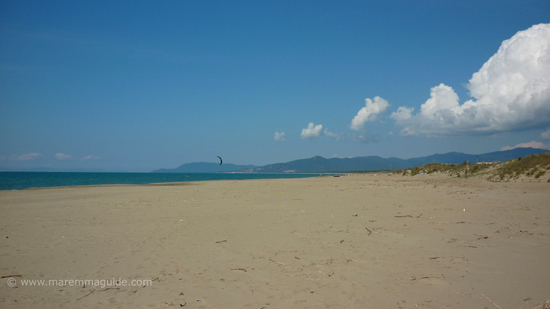 Marina di Grosseto beach is a wonderful stretch of wide golden sands, perfect both for those who like their beaches a little more tamed than 'au naturel' as well as for those who like them a little wild. Its sands stretch a long way from the centre of town, with lots of facilities and coloured sunbeds and parasols, all the way into pine wood backed dunes and on towards the beaches of Fiumara and Le Marze. 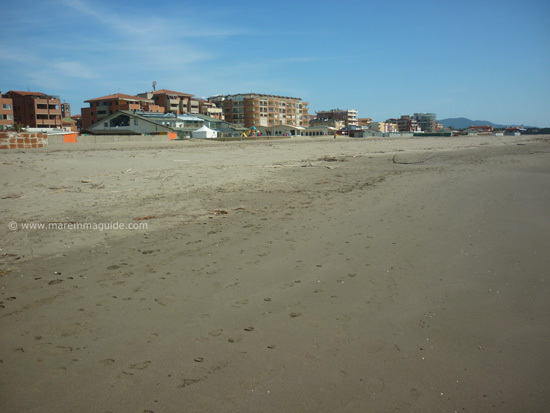 Looking towards the Marina in March when the "bagni" are still boarded-up and the beach completely free of parasols. The "bagni" (beach establishments) here - unlike most along Maremma's Tuscany coastline - aren't wooden structures that need repair from the storm damage of the winter before each season's opening, but permanent, purpose-built - and some architecturally striking - buildings on the sands where the dunes would have been. Their front entrances face a very wide paved promenade that runs the full length of the town from the Marina after which the town takes its name with its boats at the southern end, to the open "pineta" to the north. There are LOTS of bars restaurants and "bagni" bathing establishments along the promenade in Marina di Grosseto, from a Napoli to a Gondola to a modern/funky themed experience. 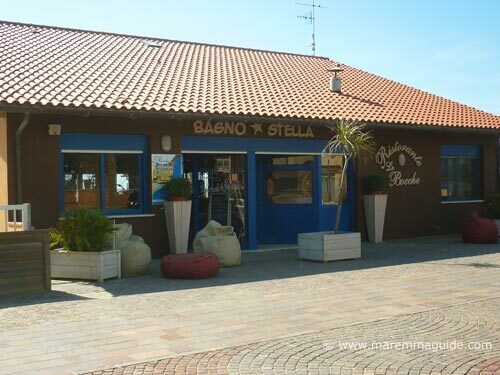 But the one that caught my eye - because it was one of only a couple that were fully open in March (the others were all still shut and bordered-up on their seaward side) was Bagno Stella. You can read their full menu on this page. 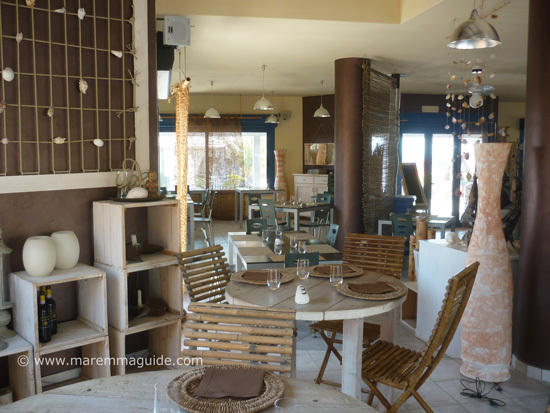 Eating out at Ristorante Le Bocche and most of the other restaurants on the beach aren't cheap options: the antipasti here start at Euros 10,00. But back from the promenade into the town you will find a lot more bars and places to eat to suit all budgets. You will find pay and display parking - the blue lined bays - right behind the promenade and beach. If those are all taken then there are many residential side streets (just do a quick check that they aren't permit only, most aren't) where the parking is either pay and display or free. 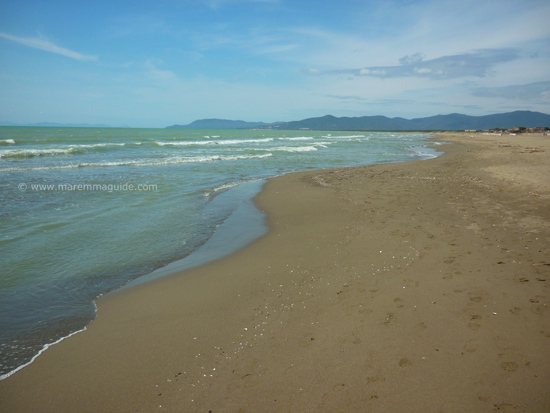 The promenade and paths between each of the restaurants and bathing establishments make Marina di Grosseto beach one of Maremma's easily accessible by wheelchair beaches. Even further north along the beach to where the apartment blocks have finished and the "pineta" (pine wood) backs the beach rather than apartments and houses etc, there are a few paved footpaths that enable access right down to the sands. 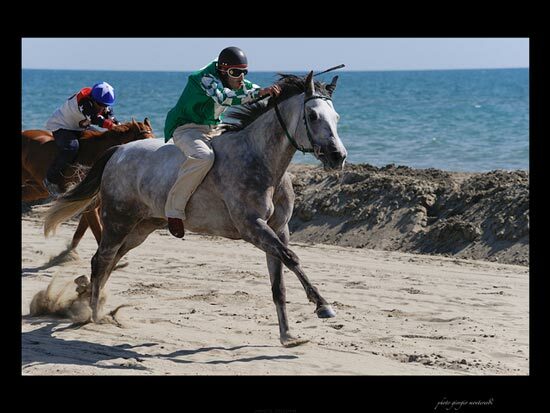 The bare-back thorough-bred horse race called the Palio dei Venti was held for two years along the sands of the Marina di Grosseto beach during the middle weekend in April: the last event was held over the weekend of 18 and 19 April 2010. The third year's event was cancelled at the last minute, but I'll update the Maremma Palio's calendar here if I hear that it is on again for this summer. 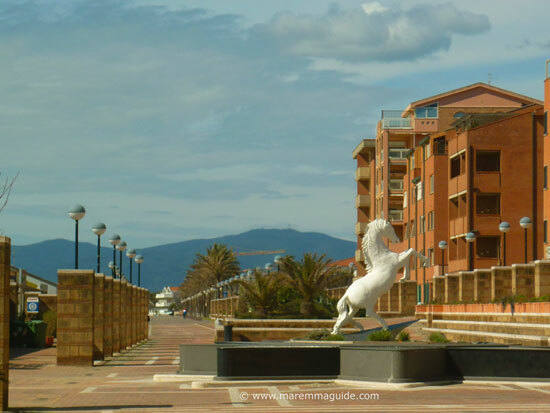 There is a wealth of accommodation choice along this part of Maremma's coast: from bed and breakfast, to self-catering apartment hotels and campsites.